Took my parents to Tofu house. They are visiting from California. We ordered fried tofu and seafood pizza as the appetizer plus specials and beef bone soup as the entree. There were plenty of food for the 6 of us. My dad loves their kimchi and my mom likes the rice in stone pots. My sons cannot stop eating the beef bone soup. My husband enjoyed the fried whole fish. We were all full within the hour. Very fulfilling family dinner with good value. 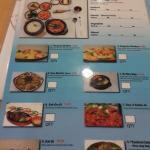 When you would like to eat korean food, I recommend this tofu house. They cook rice in Korean traditional bowl, so you can enjoy the scorched rice as well. For non-Asians, they adjust the spicy sauce according to your taste. And the waitress is beautiful. Very cute. Been to Tofu House? Share your experiences!